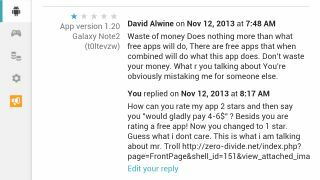 Today i got another review on my free FSWizard Android app. It wasnt bad. 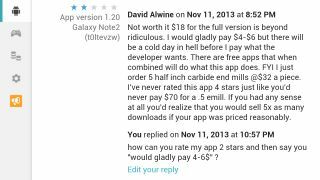 The guy gave 4 out of 5 stars, but then he added that he would gladly pay 4-6$ and that 18$ for the pro version is beyond reasonable. I replied that the price is what it is, explaided my point of view and thanked him for a good review. And then denied that he initially gave me 4! Sir. Take your business somwhere else. Update: guy changed his rating to one star and wrote he does not know what 4-6$ i am talking about. Friends, if you know a guy named David Alwine, keep away from him. He is an utter lying jerk! the good the bad and the ugly. They all have a right to speak up which is why I shelved a rotary table project. No one wanted to compemsate me for the time and heart ache it took to program. they did not understand what it took to complete a software / hardware project and expected their friend (me) to give it away. But I survived and my world is quite and peacefull.